The department title, top navigation links, and footer links appear on all site pages. 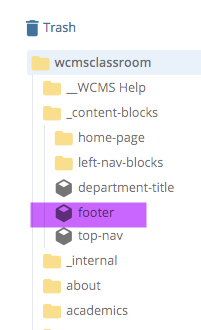 The blocks for the department title, top navigation bar, and footer are located in the "_content-blocks" folder. To edit the content blocks, simply use the WYSIWYG editor to create text and links. To change a top navigation edit the block. Click on the "top-nav" content block and click the "Edit" tab. You'll be presented with a bullet list. Each bullet list item is a top navigation item. Simply edit the bullet item and relink if necessary. Publish the entire site to update. The links in your footer are edited in the "footer" content block. Click on the block and then click "Edit"
You'll be presented with a form. This form allows you to enter social media links. The social media icon will automatically appear. See image for social media types allowed. If you leave the social media links blank, nothing will appear. You also have the option of creating custom links like "Feedback" or "Contact Us"
The "Link Text" is what will show up in the footer. "Page to link to" is where you'd browse to a page IN your site. "Or enter a URL" is where you'd paste or type in a URL of a page outside your site. 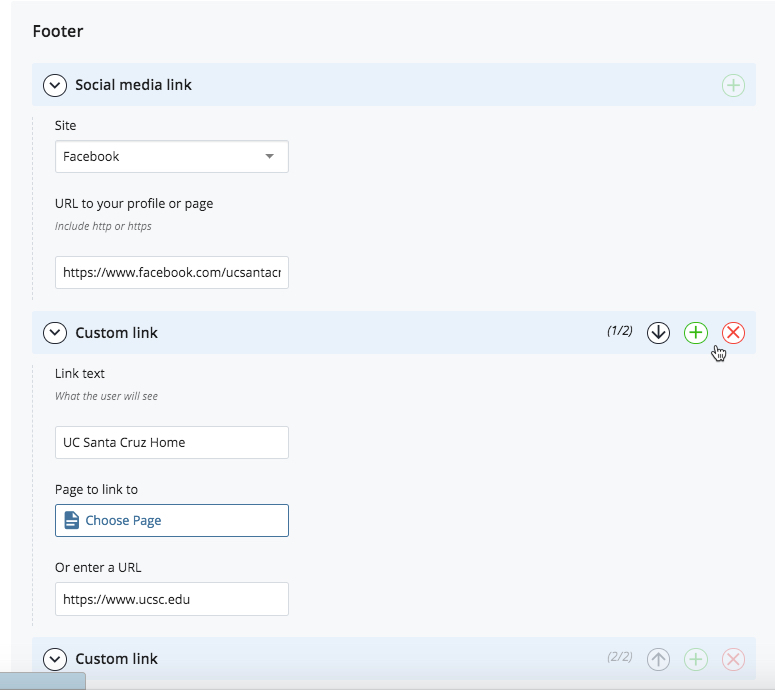 Click the "+" to add more links or social media links. They can also be removed by clicking the "x" and then reordered when clicking the up and down arrows. NOTE: If you make changes to department title, top navigation or footer, re-publish your entire site to have the changes take effect on all pages on your website.